Mum's big move: "Christmas is cancelled. For now! Say sorry." 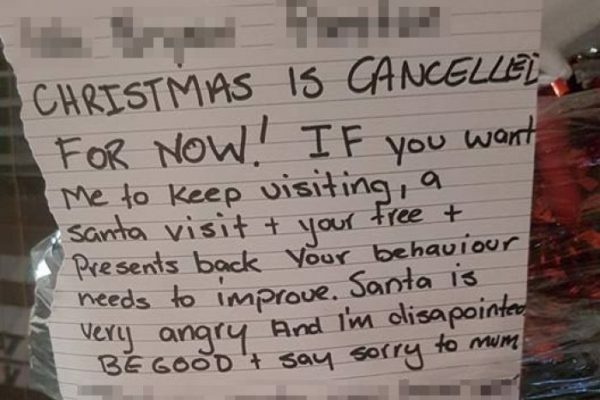 An end-of-her-tether Queensland mum has put her foot down, wrapping the family Christmas tree in plastic and tacking up a note from Elsie the Elf to advise her kids “Christmas is cancelled for now”. Let’s face it, most parents have probably almost been where this frazzled mum was when she took this drastic action. Many of us have found ourselves warning our children that Santa won’t come or they might be on the “naughty list” or that Father Christmas is watching. This mum just pushed things a little bit further into unfamiliar festive territory. Gulp. We have to admit this has actually scared the willies out of us, so we can’t imagine how the kids in question felt. A photo of these heart-stopping Christmas consequences was shared on the ABC Brisbane Facebook page and followers immediately began weighing in on the wisdom of this approach. While experts warned against similar drastic festive action, many parents were nodding and muttering things like “I hear you, girlfriend” as they surveyed their own living rooms, brimful of challenging and exhausted kids. “I think that we get into dangerous waters when we speak on behalf of Santa Claus or his elves,” parenting authority Dr Michael Carr-Gregg told the ABC. The Facebook commenters on the ABC Brisbane page had varying responses to this mum’s firm festive act. Some thought she should stop hiding behind Santa and crack out the wooden spoon (to be clear, it’s not okay to smack anyone, least of all children). “Stop lying to your kids with fairytales. Give them a spanking if they’re being disobedient then enjoy Christmas,” one man posted angrily. Some figured that this was a total parenting fail, perhaps out of touch with the challenges of parenting small children. “Obviously a loveless family. Naughty kids are usually crying out for attention,” another (freaking judgemental) man said. Some were issuing a high-five from afar, but had not quite crossed this line. “Very close to it at the moment with finances being so tight and the kids playing up,” a sympathetic dad commented. Others saw the silver lining. Or the silver bauble, really. “For all of those with toddlers this is a great way to keep the baubles on the tree,” one practical mum posted. Others still considered this excellent parenting. “As a mother of 5, foster Mum of 2, Granny of 13 and a great grandmother I say well done. Its great to see a parent in control,” a feisty granny wrote. What do you think? Tough love gone too far? Or an act of genius?